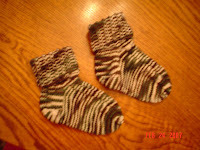 I found some camouflage yarn by Bernat in their Softtee Chunky and they seemed like a good choice for grandson #1. I "guesstimated" on the number of stitches. I measured them by a drawing of the bottom of his foot. We'll have to see it they will fit -- otherwise there is a younger grandson they will fit.